There is a sausage crisis in my freezer… If I don’t bring down my sausage population soon, there may be a revolt, or a mass migration to the freezer next door. I can’t really help myself. I have a passion for that moist, sometimes juicy, perfectly seasoned, perfectly packaged meat product that is the humble sausage. I don’t discriminate; any sausage will do just fine. With the summer grilling season well under way here in Kansas, there are great deals to be had on a plethora (bonus points for using that word in a sentence) of sausages at the grocery store, farmers market and butcher shops. I have andouille, chorizo, Italian, smoked Italian, kielbasa and brats a plenty. 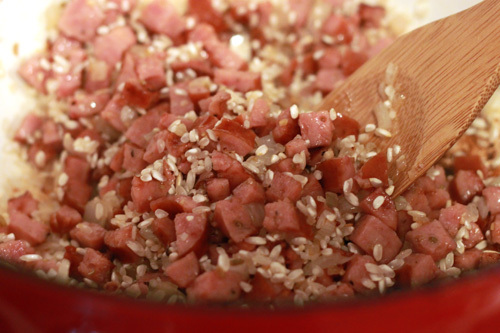 So blinded by my need to cull my sausage herd, I decided to cook a sausage risotto; in the summer, in Kansas, when even the thermometers are sweating. I was forced to contemplate my sanity as I stood over my boiling pot of risotto, stirring for all I was worth, and praying for a stray breeze from a passing cat. I love this recipe though, so I suppose my brush with heat stroke was worth it in the end. My husband, who was parked in the cool comfortable basement for the entire ordeal, certainly thought so. This recipe calls for sweet Italian sausage, but I used a smoked Italian style sausage this time around. Both versions are very good. The smoked sausage version is a more earthy and complex tasting, while the sweet Italian is fresher, with a simpler flavor. Risotto almost always starts the same; cook the rice in some fat (usually oil or butter) for a few minutes, add wine, then add a boiling liquid a bit at a time, making sure it gets absorbed after every addition. Any variation to the theme after that is up to the individual. Did I mention the stirring? Yeah, it’s a bit of a pain. I have to admit I slack off on the stirring, at least during the first half. I stir when I add the liquid, then maybe once or twice more. I pick up on my stirring during the last half of the cooking, and I haven’t really had an issue. My risotto still comes out nice and creamy. If you add the spinach right at the end, after you have taken the pot off the heat, it stays bright green and fresh-picked tasting. Sorry Popeye, but I like my spinach much better this way. Combine the tomatoes and their juices, the chicken stock/broth, the water and the Italian seasoning and bring to a bare simmer in a small pot. Heat the olive oil in heavy saucepan or Dutch oven and add the onions, garlic and sausage. Cook over med heat until the sausage starts to brown and the onions are tender, about 5 minutes. Add the rice and stir to coat with the oil and cook for about 3 minutes. The rice will start to become translucent around the edges. Add the wine and stir until completely absorbed. Start adding the tomato/broth mixture about a cup at a time, stirring occasionally, until the liquid is almost absorbed before adding another cup. For the last few additions of liquid, stir the rice almost continually. This will help make the risotto nice and creamy. The total cooking time should be about 25 to 30 minutes, and the rice should be just tender. 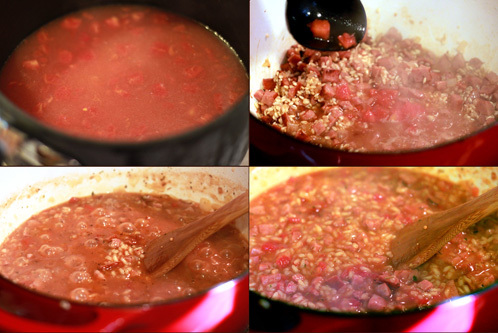 You may not need all of the tomato/broth mixture. Remove the pot from the heat and stir in the butter, cream and parmesan. Add the spinach and mix until the spinach is just wilted. Season with salt and pepper to taste and serve right away. I must have been channeling you while making pizza on the grill the other night. It was over ninety degrees, so cooking a pizza outside seemed like a bright idea. Until I actually opened the grill to flip the dough over, then linger there while I blistered my arm (figuratively) fussing over the topping placement. It was not my finest moment. I’ll take stirring a risotto in the heat over grilling another pizza any day. And this one looks delicious. 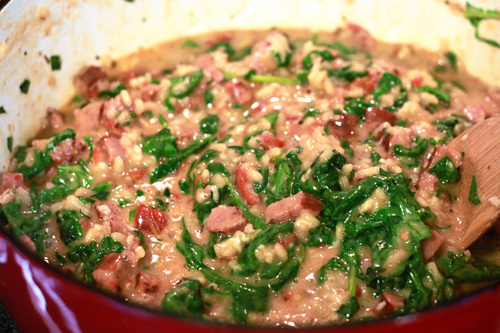 I made a sausage risotto a couple of weeks ago, but I love the addition of spinach in this one! I sometimes do this, with a bottle of beer instead of wine, and some fennel seed. 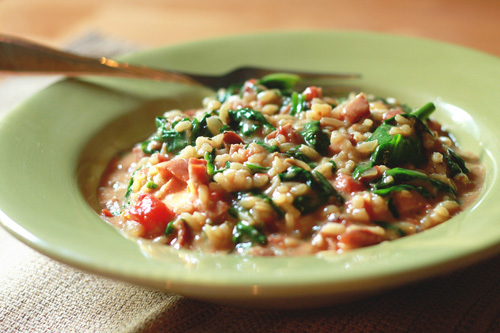 That is one tasty looking risotto! Ooh! this looks amazing! Thanks for sharing the recipe. Your blog was worth the read. Just by looking at those pictures make me hungry.I have learned so many things from your blog and I will certainly try those recipes that you have provided thanks. Do you make a side with this? Also, what other meats can you use in it? Thank you, very useful. I wasnt really a big fan of Spinach for many years (ok, that’s a total understatement, I hated the stuff), but after shacking up with a vegan I kind of had to put up with it, and have slowly come to love the stuff. Spinach curry is undoubtedly my absolute favourite! I even found an entire spinach recipes website which is my new favourite site now, you should have a look! I made this last night.. my first time making risotto and it was unbelievable! Our taste buds thank you SO much, for this recipe. Simple and will definitely make again! So..delicious!! !.Im live in caregiver,I made dinner for the family all the time..This recipe is a BIG HIT!! !even the kids loved it..Thanks for the recipe.Simple and easy to prepare.